Hello from my corner of the web! 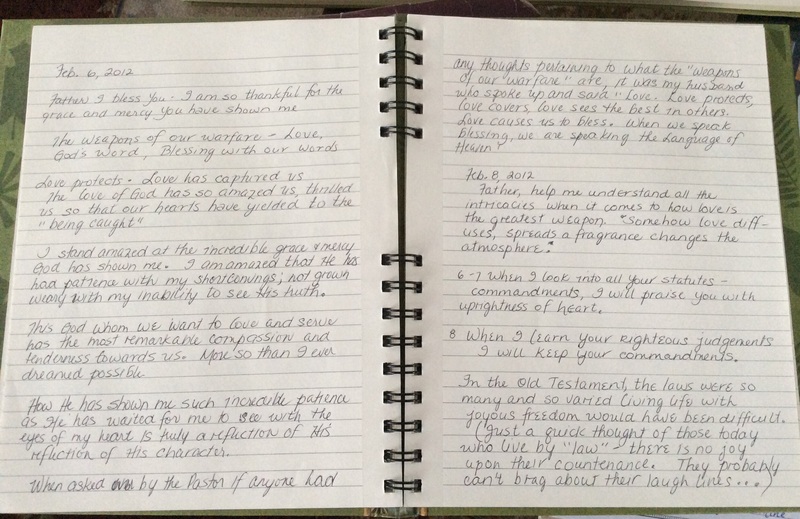 With our move six months ago and my husband’s retirement, it has been months since I have written here and I have missed this corner of quiet reflection as I ponder all the ways God’s word is greater than gold. Some of you may have breezed through this kind of transition, never missing a beat, never missing an opportunity to post and stay in touch. I thought perhaps that might have been my experience, but sadly, the truth is, it is not. Blogging for me, has been about sharing our learned experiences and learning why God’s word is greater than gold. Sharing what the Father is teaching us in our day to day lives and how His word impacts and changes our hearts. I have sure missed my time here at Greater than Gold sharing the lessons God teaches me and even though I have not written posts about them, His hand has been active in my heart. Very active. But, my days have been so too! And that activity is something I have had to grow into. To trust my Father in. You see, I have spent many years on my own while my husband has been at work. I have loved that time. Never having raised children and learning how to share my daily life with a house full of family is not a gift I have been given and I am ok with that. I have considered my time to reflect and ponder the things of God a gift however and I am very thankful for the years I have had to immerse myself in the River of God. My husband and I have dreamed these days even as we treaded the waters of prostate cancer. Our dream has kept hope alive! We have dreamed and trusted and believed God for health and the past few months have found us both stripping the kitchen down to the bare walls in order to bring about the kitchen transformation we have dreamt of. The bathrooms too were taken down to the bare walls and we are thankful for the strength and health to do the work ourselves. Instead of picking up a pen I have picked up claw hammers to remove floor screws and taken a broom and swept up old tile flooring carting the old outside to be taken to the dump…and wallpaper stripping, choosing fresh paint colours, new bathrooms and trim and crown moulding, flooring and tile choices…Well, I am still in the River of God, but the current of the River changed and has taken me a little further downstream, a little further from the comforts of the shoreline. We have dreamed these days in years past and sometimes I need to pinch myself to make sure I am really awake! And all the while, I have thought of you! 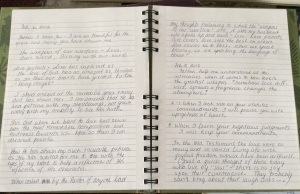 I have been awake enough to know I have not written more than six pages in my journal these past six months…awake enough to know I have needed to learn how to transition into this time of life change with grace and wisdom. Awake enough to know the Father has me in the palm of His hand even though everything about my daily life is so very different to anything I have ever known. I am awake to His Presence in my life, awake to His Voice in spite of life’s changes, awake to the love He has been pouring into my life through the new family of God He has brought us into. It wouldn’t be truthful to tell you it has been easy though. I have faithfully kept a journal for most of my life and written more seriously for at least the last fifteen years and to not pick up the pen or sit down at the keyboard feels like part of me has been amputated. I know that is not the actual case, nor is there cause for alarm. I need only readjust myself as I travel in the River and trust the Father to determine the speed and direction of the current He has me in. I am here. I AM is here. His Presence has never left nor has He forgotten how He has wired me. He speaks peace to my heart and speaks words of wisdom. I can hear, I am awake. Today, I am here and want to let you know that whatever circumstance you find yourself in, God has not forgotten you. You are engraved on the palm of His hand and His heart is ravished by you. I ravish His heart too. My blogging may look a little different these days, but sharing with you why God’s Word is greater than gold is still a burning desire in my heart. My next post I am going to tell you about how hard it has been to pick a tile for the kitchen and bathroom backsplash. Such a mundane topic – Nay! In the choosing He spoke to my heart about how we in the Body of Christ are living, tumbled and honed stones. Oh, how I want to be that honed stone reflecting His image. I hope you will meet me here, for He is here. Today I am linking up with Dawn at Random Journal Day. I just happen to be the featured random journal keeper too! This first picture is when I once again became serious about learning to listen for the voice of the Holy Spirit. 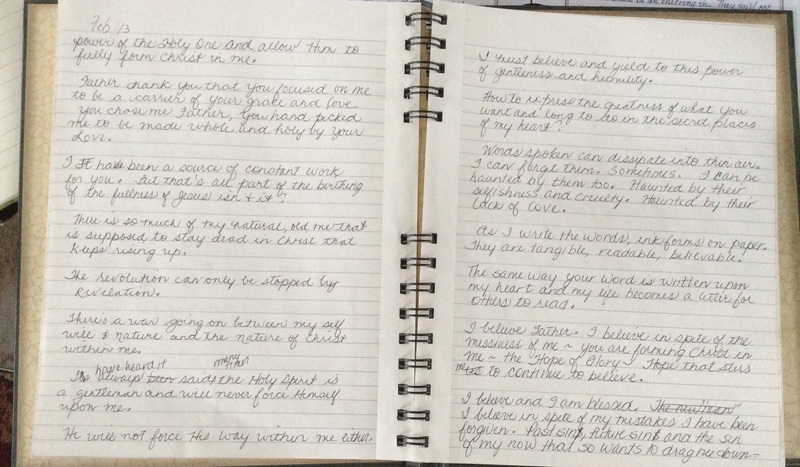 Each of these journal pages has a Scripture and I remember thinking, ‘if the Word of God is alive and active, continually speaking to me, then I will wait and write what the Word of God speaks to my heart. 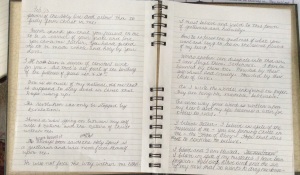 Nothing from my head will go on these pages, nothing I may have conjured up myself.’ I look at them today and marvel at how the Lord encouraged me even then. He says, in case you cannot see it, ‘Your eyes are open, your ears can hear.’ This was long before I knew I had an issue with my hearing! 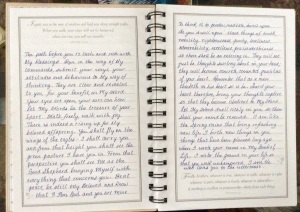 Years ago I threw out journals written in beautiful calligraphy, because in a time of finding my way through the maze of life I got discouraged and chucked them, dismissing the very idea that the words could have come from the heart of God. My second photo is the first journal I randomly opened this morning ~ and yes, much to my shock it opened up to this same date three years ago. This would have been one month before we learned that my husband would be diagnosed with prostate cancer, one month before the suicide death of our son. God was preparing me for what would become the biggest fight of our lives thus far. As of this date He has won! Please read Sought Out. also written at this time. Here you will hear His heart expressed, how He feels about you and I. His words carried me, continue to carry me and I pray they resonate deep within your hearts as well. I had been sitting on the loveseat thinking about going to the pool, not being very serious about my quiet time as the water seemed to call my name. Little did I know, I was about to be immersed in the Living Water that would have a lasting impact upon my heart. My third photo is once again from a time in February, two years ago. I was thinking about when God wants to birth something new in our lives, often it is birthed as a result of us holding onto His Promise, guarding our hearts so nothing can steal the promise. That morning He showed me how all that is required of us is to believe. Simply believe. The Word doesn’t say, ‘hang on with all your might and believe, believe as hard as you can as much as you can.’ It simply says, ‘Believe‘. Believe the Holy Spirit has come upon me. Believe the power of the Holy Spirit is hovering over me. Believe the Holy Spirit is protecting the presence of the seed of the spirit within me. I ended that day with these words ‘ In my shame, Father, its hard to draw close to You. Father would You unlock me from the prison of shame? I know You have things, plans all prepared for me, for Bruce and me to walk in. I need to walk free from the tangled grip of my flesh nature. I don’t want to be disqualified because of my choices. I know You want me to take my position. In my weakness, I receive Your strength. The seed of Your spirit has come into me and I am Your own. Chosen. Beloved. Lord, I receive the fullness of Christ, fully formed grace ~ enough ~ sufficient for my every need. I believe Your grace and strength are shaping me, perfecting me, forming the fullness of Christ within. I believe Lord Jesus, I yield and receive You. I am listening for Your heart. Word of God speak.